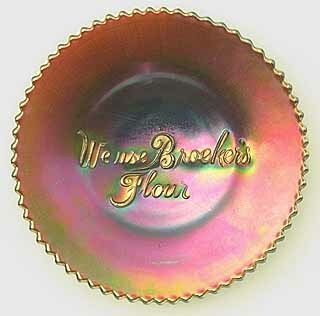 Very plain with only the script lettering “We Use Broeker's Flour” across the center. Still, these 6-inch plates are rare and desirable enough to command good prices. The database contains a recent sale on eBay, thanks to Cecil Roeder for the information and picture. He noted that he had just found out that Broeker's Flour was made in Owensboro, KY at 108 Crittenden Street starting in 1893 and continued through the turn of the century.